L.A. 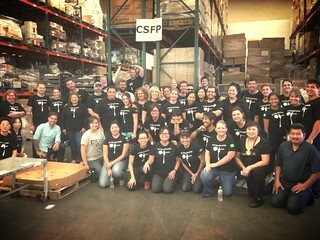 Chefs Volunteering at L.A. Food Bank! Thank you ALL for volunteering with us last weekend! On Saturday, August 10th, many of L.A.’s best chefs and food lovers will be joining L.A. Bites Hunger at the Los Angeles Regional Food Bank. Together we’ll spend the morning sorting food at the main warehouse in downtown L.A.
Volunteering along-side the chefs will be several food industry friends, writers and supporters including our good friend (and food lover) actress, Valerie Bertinelli (Hot In Cleveland). NOTE: Many thanks to those inquiring about volunteering this weekend, but we are completely filled for the 8/10/13 volunteer event. Please follow @LABitesHunger on twitter for upcoming events. L.A. HUNGER FACTS (from the Food Bank website): One in six people in Los Angeles County is at risk for hunger. They are neighbors, children, seniors, families and friends. We help them by collecting food from various sources including retailers and farmers, and distributing it with the help of more than 650 food pantries, soup kitchens, shelters and other agencies who supply it to those in need. When product is donated to the Food Bank, it often needs to be sorted, cleaned and repackaged. We call this gleaning. 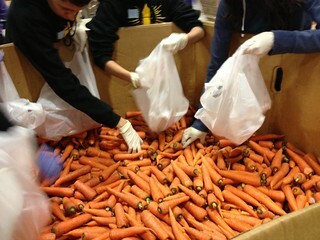 Volunteers are needed to assist with the gleaning process everyday. Our mission (at L.A. Bites Hunger) is simple: To bring our food community together and bring awareness to our local food bank using social media, such as Twitter, FaceBook and Instagram. Please support us by re-tweeting, liking and sharing with your friends and followers. Read about How the FoodBank Works. 1. All volunteers are asked to complete a liability release prior to participating in programs at the Food Bank. Download, print and sign a copy of the release, found HERE. We will collect the forms from you when you check in. Look for the “L.A. Bites Hunger” green banner. In case you forget your form, we will have extra copies available. 2. Volunteers must wear closed toe shoes. No sandals or open toe shoes allowed in the warehouse. 3. Our scheduled volunteer time is 9am to noon. Parking is limited within the facility but there is plenty of street parking nearby (carpooling is encouraged). Please plan to arrive by 8:45am to check-in. We will have bottled water and caffeinated beverages on hand for our volunteers. 4. Gelson’s Markets is proud to partner with L.A. Bites Hunger and has generously donated T-Shirts for our first L.A. Food Bank event. Volunteers are not required to wear the shirts on Saturday, but we’d love to get a group photo to share! THANK YOU GELSON’S Markets! Turn left and head south on Alameda Street. Drive south on Alameda for approximately 1 mile. Turn right on East 41st Street. 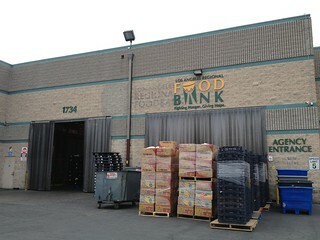 The food bank is located at 1734 East 41st Street, between Alameda Street and Long Beach Avenue. Please follow @LAbitesHunger on twitter. We will be tweeting live along with our volunteer chefs. Use hashtags #LAbitesHunger #FEEDLA to retweet and repost. If you’d like to donate to the L.A. Food Bank, just text FEEDLA to 80888. You’ll receive a confirmation text. Confirm your one-time donation of $10 by replying YES! Note: For Every $1 Donated, The L.A. FoodBank Can Provide Enough Food For 4 Meals.